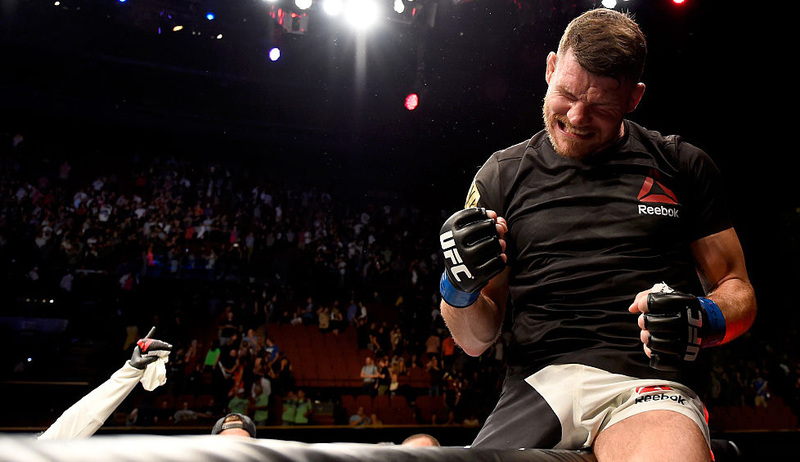 Michael Bisping was tired, but he was beaming. Back in the days where there were no locker rooms in huge arenas for UFC fighters, he sat in a backstage area at the Hard Rock Hotel and Casino in Las Vegas as other fighters, camps and personnel scrambled to get the night’s main event between Kenny Florian and Sam Stout underway. Bisping had just won The Ultimate Fighter, allowing him to do the only thing he ever wanted to do. Fight. It was 2006. His last job before leaving for America and a shot at changing his life forever was as an upholsterer. As he took in his second-round stoppage of Josh Haynes, I asked him about the future. “You’re not gonna see me in any factories for quite some time,” he laughed. You will never see Bisping in a factory again. 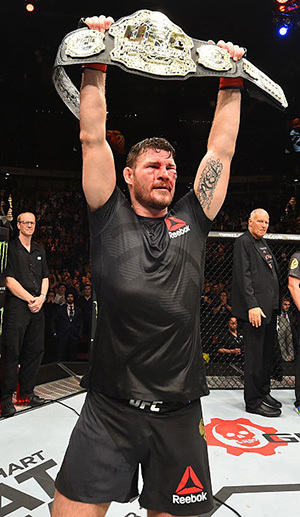 And though his resume will continue to see him list television studio analyst and actor, he will always be a fighter, even though he officially announced his retirement on his podcast, Believe You Me with Michael Bisping, on Monday. Almost 12 years to the day after winning TUF 3, the 39-year-old Bisping leaves a Hall of Fame legacy. It includes a stint as world middleweight champion, a place on the top of the list for most UFC fights (29) and UFC wins (20), and victories over the likes of Dan Henderson, Luke Rockhold, Anderson Silva, Cung Le, Brian Stann, Jason Miller, Yoshihiro Akiyama and Chris Leben, just to name a few. That’s not even touching on the intangibles, the things that don’t show up on a win-loss record. What about his trash-talking rivalries that captivated the sport and drew in fans from around the globe or how he became the focal point for MMA in his home country of England, in effect kicking off the UFC’s international expansion in 2007? No one really knows just how much media Bisping had to do during those early days, when he was tasked to explain the sport to those who had no idea what it was. Then he had to go fight against opponents who knew that a win over the UFC’s newest British star would propel their own careers. But the Manchester product always answered the call, and his fans in Europe loved him for it. There is probably no way to truly imagine what it’s like to have an arena full of fans cheering for you, but “The Count” did let me in on it during one of the UFC’s European events that he wasn’t fighting on. As we walked through the tunnel into the arena, I asked him to go out a couple steps ahead of me so I can think those people were cheering for me. He laughed and agreed, and as he stepped into the arena, the place erupted and the fights hadn’t even started yet. I took it all in and caught up to him. He just smiled. These were his people. And whether they cheered him or booed him over the course of his career, they had a reaction. All that was left for Bisping was to go into the Octagon and win fights. Not always, though. And that’s what changed the public’s perception of him over the years. Maybe you could do without the trash talk or the cocky proclamations of victory, but you had to appreciate that when he fell down, he always got up, fists clenched and ready to fight. It’s almost funny to look back and see that in November 2009, many believed Bisping’s career was on the line when he fought Denis Kang in Manchester. He was coming off a knockout loss to Dan Henderson in their first fight four months earlier, and with another loss, he was going to be written off. Just trying to look after my family. I’m trying to take care of my kids the best way I can, and that’s using my fists. And Bisping had a rough start against Kang before finishing his foe in the second round. He would lose his next fight to Wanderlei Silva in Australia, but still was in a good enough humor to join up with Quinton “Rampage” Jackson to demand the UFC staff bus take a detour to a local McDonald’s after the fight. Then came a 7-4 run where it looked like Bisping’s career was settling into one where he was going to remain among the middleweight elite, but never get that shot at the title. The fourth loss on that run came against Rockhold in late 2014. Two fights later, Rockhold fought for – and won – the UFC middleweight title. 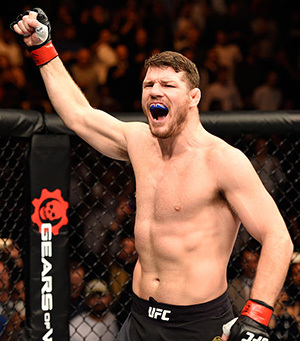 Bisping rebounded with a win over CB Dollaway in the spring of 2015, but as he prepared to face fellow contender Thales Leites, he admitted that a crack at the crown was still a long shot. But Bisping beat Leites, then he beat Brazilian icon Anderson Silva, and when Chris Weidman was forced out of his rematch with Rockhold due to injury just a couple weeks before the UFC 199 main event, he got the call. He took it. And on June 4, 2016, the impossible dream became a reality. At 37 years old, Michael Bisping was a world champion. He evened the score with Henderson in October 2016 before losing the belt to St-Pierre at UFC 217 last November. A week later, he accepted a fight against Kelvin Gastelum that took place just three weeks after the GSP bout. It was another example of why Bisping was always cut from a different cloth than everyone else. And even though he lost to Gastelum in what ultimately would be his final fight, finally, the entire MMA world appeared to be in his corner. It was well-deserved and long overdue recognition for someone who wanted that acknowledgement but never needed it. What Bisping needed was a purpose in life, something that would allow him to take care of his family and look himself in the mirror and feel accomplished. Fighting provided that, and when he won that UFC contract in 2006, that’s all that entered his mind. Not championships, not fame, not glory. Bisping’s wife, Rebecca, and three kids – Callum, Ellie and Lucas – are undoubtedly proud of his accomplishments and a job well done. The fighter’s life is not an easy one. No one knows that more than Michael Bisping. But few have done it better.